1) If your apartment is tiny, consider having roll-away and hide-away beds and furniture. Modular furniture goes the extra distance when space is short and still packs in lots of style. If you want inspiration, check out this video about someone who transformed a tiny and ugly space into something elegant and unique. You can overlay rugs for an exotic effect while covering up ugly carpet or hard surface floors. You can also put down temporary tiles in most spaces to create more attractive floors. Visit this site for more information about how one renter transformed a tiny New York apartment into a cool space with a spa bathroom. 3) Deal with ugly or uninspired color choices by covering up or by going with the flow. Landlords often paint apartments in decidedly uninspired colors – such as taupe or white – to create a clean-looking and seemingly larger space. The problem is that dealing with a drab palette day after day can be draining. 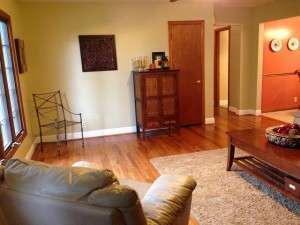 At the opposite end of the spectrum are landlords who paint walls or cabinets in odd colors – such as lurid green – to create a unique space (or maybe because a color was on sale). 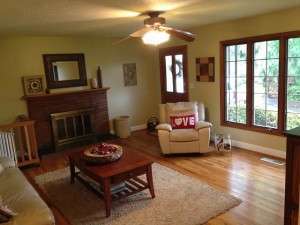 In both cases, you can deal with this situation in one of two ways – you can cover up the offending color or find some way to make it work. Stick-on wallpaper can cover up ugly wall colors, but covering up unsightly tiles or cabinets takes extra work. In these cases, you may need to shop for home accessories and accents in complimentary colors that celebrate the hue. 4) For open concept studios, find unique ways to get some privacy. Set up a loft bed. If you have high ceilings, you can create a tree-house effect by creating a temporary loft bed near the ceiling. Create a separate bedroom with shelves. Buy several tall bookshelves and place them together to create a wall or two. Use privacy screens. This is an affordable option that can also add some color to your space. 5) Swap out what you can. 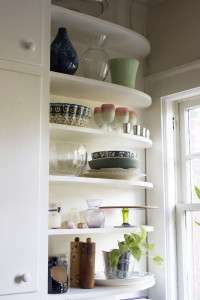 Ugly cupboards get an instant facelift when you add higher-end hardware, and light fixtures can be changed out for a better look. Just keep the originals safe so that you can swap them out when you move out. Light switches and outlet plates can also be traded temporarily for something cooler. In most apartments, you can also replace your showerhead to something more stylish that also offers better water flow. Keep in mind that you can remove things, too. If your kitchen cabinets are ugly and cheap, you can make them look nicer in many cases by removing the doors and lining the insides with shelf paper. You’ll have open-concept cupboards that look great. 6) Try decals and stick-and-peel wallpaper. You can find out about available products at this website. The same website (here) has a list of temporary fixes for floors, glass decals, tile stick-ons and more. Decals and stickers are great because they allow you to change the entire look of an apartment without spending a fortune or violating the terms of your lease agreement. 7) Know where to invest. You can buy inexpensive used furniture or even get freebies by combing through online classified ads for your city and checking out local discount stores. You will want to also check out used furniture stores, but you will also need to consider where to invest. A new mattress is a must and it pays to buy quality, since it can affect the quality of your sleep. You will also want to be wary about buying children’s furniture or soft furniture used. If you do some buy used or inexpensive furniture, use paint and fabrics to transform it and make it your own. This video shows how you can paint furniture. This site shows you how to reupholster a couch. Other furniture can be even easier to re-upholster or you can simply create fabric covers for chairs and couches to save time. 8) Check out what your landlord allows – you may be surprised. Many will not make a fuss if you invest money and make the apartment more appealing. After all, it will help them rent out the space after you move. You will still want to double-check with your landlord or super before making any permanent changes, however. 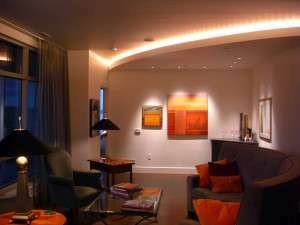 Just about every place looks better when it is properly lit up, and in many cases inexpensive apartments suffer from small windows, less light, and cheap lighting solutions. 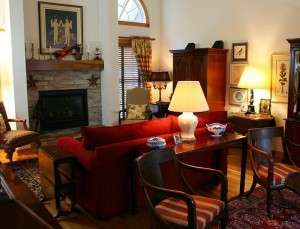 Since you probably can’t re-wire your rented home and put in all new lighting, bring in several attractive lamps to brighten the space up. Large mirrors can also reflect light and make a small apartment seem larger and brighter. Another way to play with lighting is to go clear when choosing home accents and furnishings. Choosing clear glass shelves, tables, and coffee tables can make a space seem larger. For smaller apartments, it’s a better choice than heavy, solid furniture. That main thing with an inexpensive apartment is to invest wisely and to make changes that will add some charm and style to the space. Think of modest apartments as a blank canvas, just waiting patiently for the extra touches that make executive condos so stylish. With these tips, you may just end up having the coziest and most gorgeous apartment in your building. This entry was posted in Decor & Style and tagged studio apartment, useful tips on June 15, 2013 by A. Antonow.